You may not immediately recognise today’s colourisation subject with her bob haircut. Texan born actress, Carolyn Sue Jones born this day, April 28, 1930, appeared in more than 30 films during her career receiving a nomination for an Academy Award for Best Supporting Actress for The Bachelor Party (1957) and a Golden Globe Award as one of the most promising actresses of 1959. Notable film roles include The Turning Point (1952), House of Wax (1953) The War of the Worlds (1953), The Seven Year Itch (1955), and The Tender Trap (1955). However, it was her portrayal of the rather whacky but sensuous, Morticia Addams in the 1964 TV series, The Addams Family, that she is best remembered for and for which she received a Golden Globe Award nomination. While the show only ran from 1964 to 1966, it was syndicated for many years thereafter and gained great popularity here in Australia. Playing the role of the matriarch of an extremely ghoulish but loving, close-knit extended family with supernatural abilities, it would take Jones two hours every day to put on Morticia’s make-up and then slip into her form-fitting, black gothic dresses. I was devastated to discover later in life that her crowning glory was in fact a long coal-black wig made of human hair. It looked so authentic in the series. After all, my own hairstyle throughout the 1960 and 1970s was based on Morticia’s! Though her acting career declined after The Addams Family, she had sporadic roles in the late 1960s and 1970s, guest-starring in the TV series Batman, playing Marsha, the Queen of Diamonds, as Hippolyta, the title character’s mother in 1976 Wonder Woman TV series and Mrs. Moore, the wife of the plantation owner in the 1977 mini-series, Roots. Her last role was the scheming matriarch of the Clegg Clan, Myrna in the 1981 soap opera, Capitol. Carolyn Jones died of colon cancer at her home in West Hollywood, on August 3, 1983. She was only 50 years old. 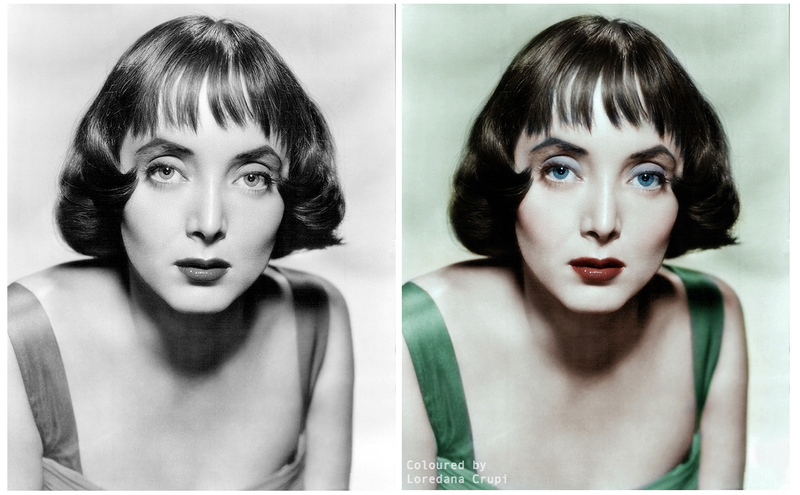 This entry was posted in Colorization, Colourisation, Hollywood, Television, USA, Women, Women in Film & TV and tagged Batman, Carolyn Jones, House of Wax (1953) The War of the Worlds (1953), Loredana Crupi, Opus Loredana, Roots (1977), The Addams Family, The Bachelor Party (1957), The Seven Year Itch (1955), The Tender Trap (1955), The Turning Point (1952), Wonder Woman. Bookmark the permalink. life ended too soon. She was gorgeous, and awesome as Morticia. Beautiful colouring Loredana.